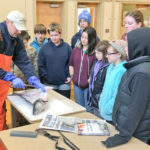 Tomorrow One Fish Foundation is headed to the Mahoney Middle School in South Portland to talk to 6th grade Geography students about sustainable seafood. I think back to the moment a couple of years ago when I first thought about telling students where seafood comes from and how it gets on their plates. 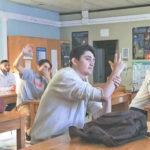 I had just served as an “expert” listening to the in-depth sustainability expeditions of 9th graders at the Casco Bay High School for Expeditionary Learning in Portland Maine. The school steeps students in long-term, real-life projects called expeditions, which are focused on a single topic. One minute into the first student’s description of his research into the 2014 closure of the Maine shrimp season I realized this curriculum was more creative, more compelling and more rigorous than anything I faced in the early 80s. The student eloquently and accurately explained the reason for the closure – an Atlantic States Marine Fisheries Commission ASMFC decision based on the precipitous drop in landed shrimp in 2012 and 2013. 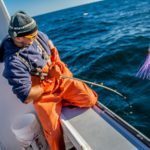 He also pointed to research from the Gulf of Maine Research Institute and other sites suggesting that warmer water fueled by climate change, along with a decrease in phytoplankton and increased predation may have affected reproduction and survival rates. This 14-year-old had done much of the same research I had done, and he had the interest and drive to keep digging for answers to questions like: What is the cause? What is the sustainable solution? How do we learn from past lessons? I came away from the experience enlightened, jealous (that I didn’t have that experience in school) and motivated. 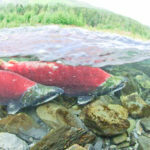 I’d been writing about sustainable seafood and sustainable fisheries for four years. Why not bring those messages into classrooms where kids are beginning to ask questions about where food comes from, and what they can do to learn more? So here I am, putting the finishing touches on a lesson plan that will ask 10- and 11 year-olds to think about how their local geography dictates what seafood is available to them, how some of that seafood is caught, and which seafood is abundant. Most importantly, I want to get them confident enough to ask questions in stores and restaurants, and to perhaps even discuss with their families why making sustainable choices is important. If I can achieve that, I’ll have succeeded.